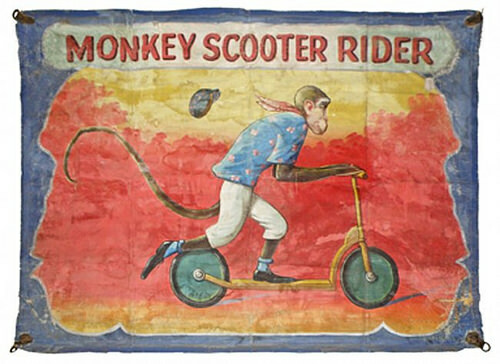 This rare and delightful 1937 French circus poster is on the auction block today at Potter and Potter’s sale. “La Femme Araignee” is an advertisement for Cirque Daniellis’ spider woman. Known as the Spidora sideshow illusion on American carnival midways, it features a young lady with the head of a beautiful girl and the body of a giant spider. Missed it? Check out the video below of Walt Hudson’s Spidora pitch and see her for yourself. “She’s strange, she’s unusual, she’s a lovely little girl. I’m going to let you look at her. Shortly afterwards we’re going to take her off the web and feed her, and you’ll have an opportunity perhaps to see that…” Little Spidora was an attraction at Atlantic City’s Steel Pier, Hudson says. And why by the way do we not currently have a Spidora single-o in Coney Island? Potter and Potter’s live auction is on February 6 in Chicago but the catalogue is online and you can bid on the poster now or in real time during the auction. Update: The poster sold for $1,200 plus a 22% buyer’s premium. We’ve come across paintings of Coney Island’s Wonder Wheel and original Thunderbolt roller coaster but rarely any of the legendary Cyclone. Are its classic twists, turns and drop as much of a dare for a painter as they are for a rider? This one painted in the 1960s by self-taught artist Vestie Davis (1903-1978) will be up for bid at a November 15th auction in Pittsfield, Mass., at Fontaine’s Auction Gallery, and online via Live Auctioneers. “I use very, very good paints–only the best–guaranteed to last,” Davis told New York Magazine in 1969. His method of painting was to make a sketch with India ink from a photograph and then transfer it to canvas using tracing paper and a light board. He began adding people to his paintings of New York scenes upon an art dealer’s recommendation. Davis’s paintings of Coney’s beach, boardwalk and amusement rides have appeared on a New Yorker cover and are in the collection of the American Museum of Folk Art. Measuring 16 inches high by 19.5 inches wide, the oil painting of the Cyclone is signed “Vestie Davis, 1965” and has a pre-sale estimate of $1,500-$2,500. UPDATE: The painting sold for $3,100. 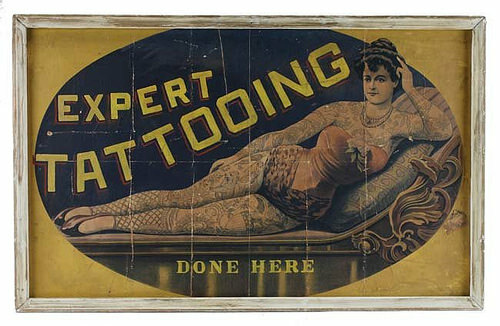 This vintage Friedlander poster featuring a voluptuous Victorian tattooed lady advertising “EXPERT TATTOOING – DONE HERE” is up for auction today at Noel Barrett’s Fall Antique Auction in New Hope, Penn. Bidding is also available online via live auctioneers. 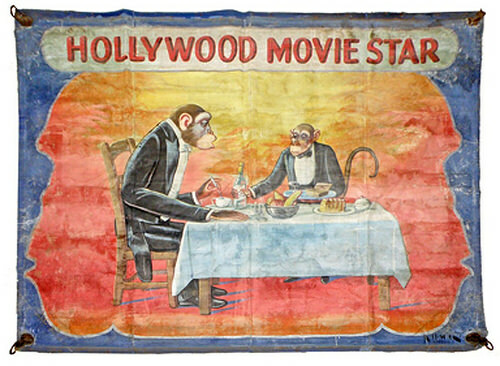 The 38″ x 24″ lithographed paper poster is mounted on board in a period painted frame. Adolph Friedlander was a prolific German lithographer whose firm printed many circus, vaudeville and magic posters beginning in the late 19th century. Tattoo posters are scarce, according to the auctioneer. Though this one has survived in a distressed state, it remains alluring. An hour before the start of today’s auction, it already has 14 bids.